Another Great Pollstar In The Books! Had a really great time again at Pollstar this year. Eyellusion’s creative director, Chad Finnerty was invited to speak on a great panel about how new tech is transforming live entertainment. Chad gave the audience a sneak peek behind the scenes of ‘The Bizarre World of Frank Zappa’ show and and had a really eye-opening discussion with moderator (and road legend!) 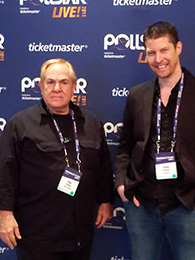 Ted Cohen and panelists like Craig Evans of Digital Nation Entertainment about where live music will go next! Big thanks to Pollstar for having us at the show again!